The pad washer will accommodate pads up to 24” in size, is wall hung, comes with a mounting bracket. The force of the water spins the pad which helps to dry it. 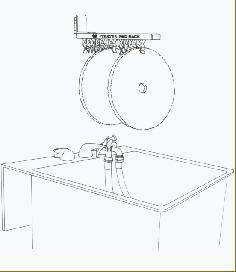 The unit should be installed near a drain and hot water supply. 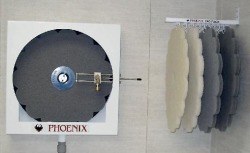 When used with Phoenix Blast Pad Cleaning Chemical, you have a very effective and quick way to clean dirty pads. 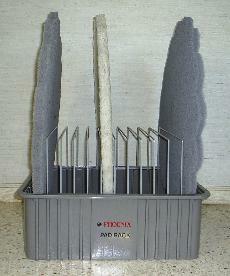 The Phoenix Wall Hung Pad Drying Rack is lighweight aluminum, completely rust-proof and will hold 10 pads. It comes with mounting screws. ♦ Will hold 12 pads. The first floor scraper that won’t scratch your floor! 48” steel handle with a 4” replaceable double edge nylon blade, vinyl handle grip. One screw replaces the blade in seconds! Extra blades available, 10/package. 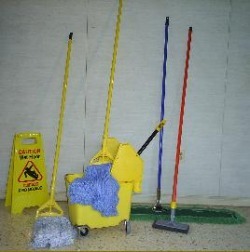 We also have a selection of other items to fit your janitorial needs.